The Games are 50% over budget The Herald reports and the contingency fund is already running low. From an original estimate of £373m in November 2007, the bill for Glasgow 2014 climbed to £454m in November 2009, then to £524m in May 2010, and then to £563m in December 2012, when the security budget was trebled to £90m. Now we hear that the emergency contingency fund is nearing depletion well ahead of the peak spending phase for the Games between April and September this year. Expect considerable rises before all is said and done. The Manchester Commonwealth Games 200 were 120% over budget, the Delhi Games 180% (ten times over budget), and the London Olympics went from 2.4 billion to over £11 billion. No-one can say this comes as a surprise. RISING costs at the Glasgow 2014 Commonwealth Games have forced the organisers to spend more than two-thirds of their £42 million back-up fund, raising fears about the final bill for the £563m festival of sport. Glasgow 2014 last night confirmed to the Sunday Herald just £13.5m of its “general contingency” cash is left. The Government previously said the money would only be spent if “absolutely necessary”, but almost £30m has now gone because organisers underestimated the time they would need to hire some venues, forcing them to revisit contracts, and because of rising prices for logistics, transport and venue preparation. First Minister Alex Salmond and others recently told the organisers to get a grip on finances and avoid further use of contingency funds. The spending is well ahead of the peak spending phase for the Games between April and September this year, when the organisers expect to spend half the total budget. The price-tag on Glasgow 2014, which runs from July 23 to August 3, has already risen by 50% since Glasgow won the bid to host the Games in 2007. The decision to raid the general contingency fund was taken by the 2014 Strategic Group, the ultimate decision-making body for the Games, chaired by the First Minister and including Glasgow City Council leader Gordon Matheson and Lord Smith of Kelvin, chair of the Glasgow 2014 organising committee. It agreed last May to use the fund to extend leases on some venues because the original time scales were “insufficient”. In September, the rising cost of contracts for transport and stadium preparations forced another raid on the contingency. And in December, the group ominously noted the pressures on the remaining contingency cash and urged the organising committee “to continue to control pressures to avoid the need to make further calls upon the general contingency”. Glasgow 2014 last night said it was confident it would stay within budget. 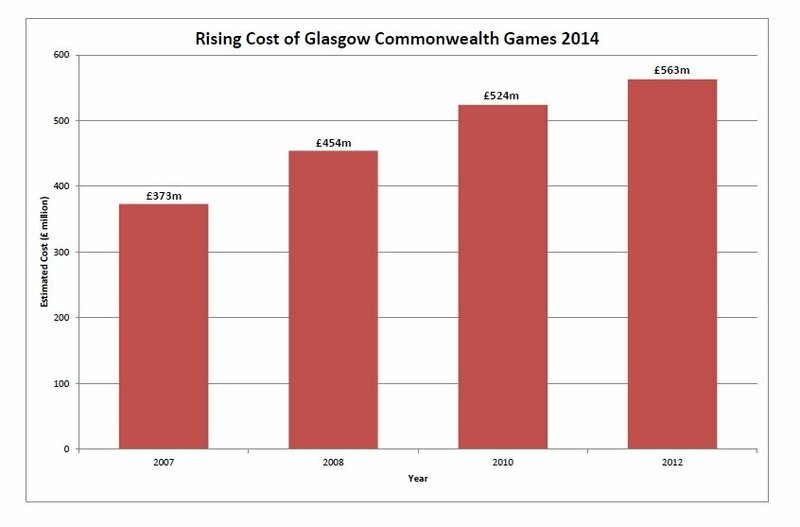 But Commonwealth Games have a history of cost over-runs, with the budget for Manchester 2002 rising by 120% and Delhi 2010 by 280%. From an original estimate of £373m in November 2007, the bill for Glasgow 2014 climbed to £454m in November 2009, then to £524m in May 2010, and then to £563m in December 2012, when the security budget was trebled to £90m. The budget includes two back-up funds: the general contingency for use in case of cost pressures, which stood at £42.3m a year ago, and an emergency pot of £24m called the Scottish Government special reserve, only to be used in exceptional circumstances with Salmond’s personal approval. This remains untouched. Conservative sports spokeswoman Liz Smith said greater transparency was vital. A statement from the Games organisers said: “At the strategic planning stages of the Commonwealth Games … contingency was set at £66m (£42m general contingency and £24m Scottish Government special reserve). “Now that Glasgow 2014 is in the final and detailed stages of project delivery, contingency spend has been assigned to contracts in areas of operations including overlay and logistics, adding certainty to the delivery of the Games. ← The End of the Commonwealth Games?